Despite being a Bank Holiday other commitments meant Michelle, Lauren and I couldn’t set off till the Sunday, which ran the risk the campsites were liable to be full – you can’t book since they all seem to be first come first served but armed with a long-list of sites and telephone numbers we reached Ambleside and then headed towards Coniston where there’s a smattering of campsites all along the lake. No surprises that they were all full but a pleading last ditch phone call to the National Trust site in Langdale managed to blag us a pitch. We arrived to see a great big ‘Full’ sign on show, yet the ‘group’ field was only 50% full. It’s a great little site (good showers!) in an ideal location near the head of the valley, with spectacular views up to the Langdale Pikes, Bowfell, Crinkle Crags etc. and 3 pubs within a 10min walk. We were joined on Monday by my sister, her boyfriend Dan and my nephew and headed off upthe path which follows Stickle Ghyll. After Lauren failed to reach a true summit on her first walk a couple of months ago we were keen to keep her motivated all the way to the top and the extra company helped. It was a warm day and I knew my Scarpa Charmoz boots were a little overkill! Michelle was wearing her new Salomon XA 3D Ultra trainers and was positively bounding up and over the rocks (mmm, maybe a lesson there!). 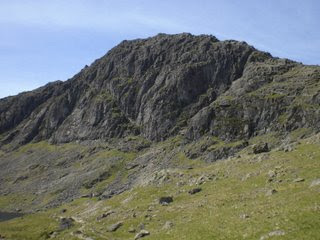 We reached Stickle Tarn and veered right around towards Pavey Ark and the bottom of Jacks Rake. Though Jacks Rake scramble looked tempting the sensible option was to leave it for another day when we didn’t have company so we headed right up some boulders to join another steep path on the eastern shoulder which led straight up to the top of Pavey Ark. From here we headed over to the top of Harrison Stickle and soaked up the fantastic panoramic views. Descent was via the steep west face down to Loft Crag, picking up the track back down to the New Dungeon Gyll Hotel and a pie and a pint. A short, hot day and Lauren could be proud of bagging her first peak! Tuesday was a bimbling day around Grasmere and up to Keswick for a mooch around the shops. I had it in my mind to look for a pair of casual/outdoory trainers with possible trail use in mind, but tono avail. Tuesday evening it chucked it down and we awoke to find the field a little waterlogged so after quickly packing we headed into Ambleside for some more retail therapy. As part of my quest to reduce my pack size/weight I plumped for a new sleeping mat in the form of a medium size NeoAir – half the size of my Prolite 3 and a little lighter. I also ended up buying a pair of TNF Hedgehog XCR trainers, more for casual wear in mind than trail-use, though I did end up wearing them for my wildcamp trip to Wales last weekend. ← Previous Previous post: Don’t Think, Just Do…. "I ended up wearing them for my wildcamp weekend in Wales"? Have we more tales to tell? Sounds like you have been having a fine time. Aye, finally managed to fit in my planned trip with my nephew last weekend. Hope to post a report shortly! Also need to catch up on your Scotland trip/expedition – I'm impressed you've written it up already – looking forward to digesting it!